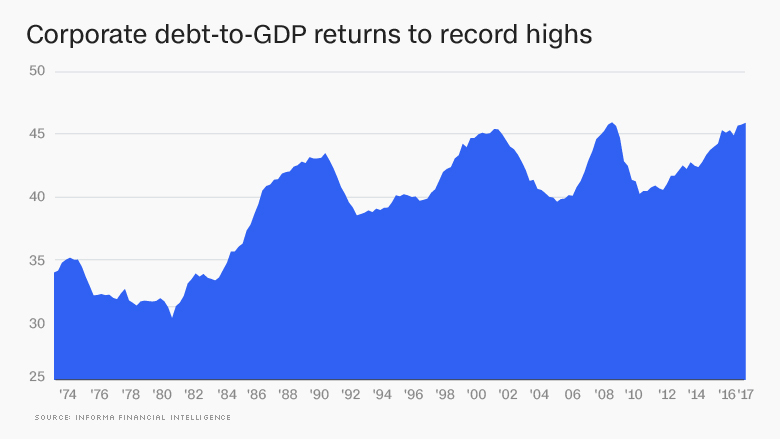 The era of cheap money is coming to an end, creating a potential problem for some companies that piled on lots of debt. Short-term borrowing costs have spiked this year, driven in part by recent rate hikes from the Federal Reserve. That's a headache for companies that need new loans, as well as companies like Campbell Soup (CPB) and Colgate-Palmolive (CL) that have taken on floating-rate debt, where interest expenses go up as rates do. Interest on that debt is often linked to three-month LIBOR, a benchmark borrowing rate that has doubled over the past year. It recently hit the highest levels in nearly a decade. "The rise in LIBOR is really biting into the private sector," said David Kotok, founder and chief investment officer at Cumberland Associates. "The free ride in the credit system is over." 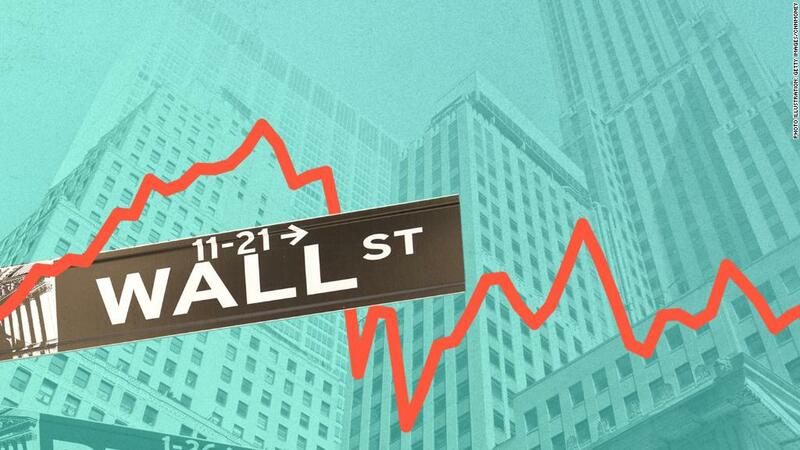 Wall Street appears to be punishing companies with high levels of floating-rate debt. Shares of S&P 500 companies with at least 5% of their debt in floating rate bonds dropped 4% during the first quarter, according to Goldman Sachs research published on Monday. That outpaces the S&P 500's 1% decline. This group of 50 stocks, which excludes highly leveraged financials, real estate firms and telecoms, trades at a 10% lower valuation than the median S&P 500 stock, the report said. Which companies are nervously watching the climb in borrowing costs? Stanley Black & Decker (SWJ), Campbell Soup and Colgate-Palmolive all have at least 20% of their total debt in variable rate bonds, according to Goldman Sachs. Other large S&P 500 companies with relatively high levels of variable rate debt include General Electric (GE), Conagra (CAG) and Textron (TXT). "These stocks should struggle if borrowing costs continue to climb," Goldman Sachs analyst Ben Snider wrote in the report. He noted that the share price of these companies has "mirrored" the fluctuations in short-term borrowing costs. It's not that Wall Street fears these companies will be unable to pay off their debt. It's that their interest expenses are rising from historically-low levels, chipping away at overall profits. "The backdrop of elevated corporate leverage and tightening financial conditions drives our continued recommendation to own stocks with strong balance sheets," Snider wrote. Companies take on interest-rate sensitive debt because it typically offers more attractive terms than fixed terms. "It's cheaper. It's a trade-off that a lot of businesses make," said Kotok. High-debt companies are also adjusting to significant changes in the corporate tax code. The new law reduces companies' ability to deduct interest payments from their tax bill. But if the rapid rise in borrowing costs reverses, investors may conclude these stocks were unfairly punished, setting them up for a rally. Goldman noted that the jump in LIBOR has been driven in part by the Federal Reserve. That makes sense because the Fed has been steadily increasing short-term rates in a sign of confidence about the economic recovery. However, LIBOR has spiked well above rates set by the Fed. Goldman blamed this phenomenon on "temporary" factors, including shifts in supply and demand caused by the new tax law and increased federal government borrowing. "We think that should stabilize, but at higher levels than the past few years," said Rick Rieder, BlackRock's chief investment officer for fixed income. The median S&P 500 company's net leverage ratio has climbed to the highest level on record, Goldman Sachs said. The good news is that companies are minting tons of money right now, in part thanks to the tax law. That gives them plenty of extra cash to cover higher interest expenses and pay down debt. Financial regulators are watching the space closely. Two business debt metrics studied by the Treasury Department's Office of Financial Research have been flashing red since early 2016, indicating "high" potential vulnerability. Federal Reserve Chairman Jerome Powell said last month that corporate debt levels have climbed, but default rates are "very low." 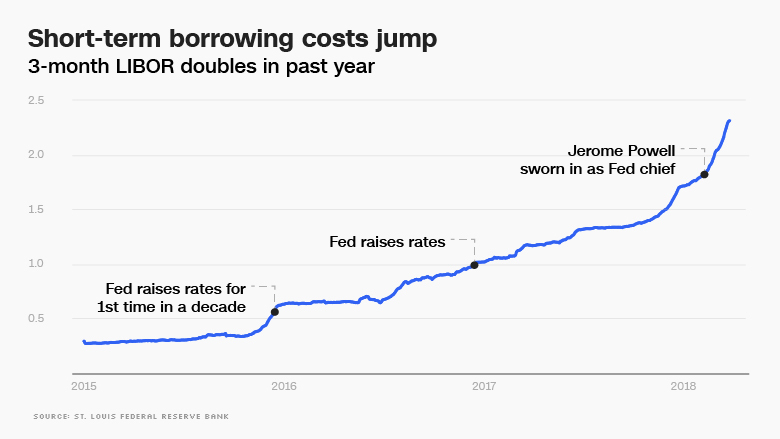 "You do see relatively elevated levels of borrowing, but nothing that suggests...serious risks," Powell said.